Article – Bring Out Your Inner Super Hero! This past weekend, as I watched a back to school commercial in which different kids take on the persona of all of the superheroes brought to life in the theatres this summer by wearing clothes representing them, I started thinking about heart health and this article. Okay, those of you who know me well understand that I’m thinking about stuff like that pretty much all of the time! But in this instance I was particularly keen on how we could all be super heroes when it comes to our heart health. What if we could reveal our insides as if our bodies were the costume? What would we see? Aside from blood and guts I would hope to see a robust heart with excellent pumping ability, highly oxygenated blood, and no signs of excessive blood glucose or plaque buildup of any kind. In this article, I plan to provide all of us a formula for producing this very “costume”. I’m going to start first by sharing some typical changes that occur to our cardiorespiratory systems with age. Then we’re going to take a look at how those standard changes compare to present day past 45 superheroes, the master’s athletes. This will be fun because you will recognize that typical change does not mean mandatory change. Finally I will wrap up with some tangible examples of what an exercise program would look like to bring out your own inner super hero! Are you feeling inspired? I hope so. You have the choice to realize super hero status or remain as you are. And, if you read this and recognize that you are already a super hero, celebrate! That is awesome and unfortunately not the norm for a greater than 50 year old person. Wherever you are at this point in our discussion, I’m now going to provide you some information for how you can improve your heart’s function. We’ll start basic and build. I was in physical therapy after my hip replacement surgery and then for my paralyzed leg. When I was told there was nothing more they could do for me they recommended I work with a personal trainer who had experience with challenging clients. I worked with one fellow for a while, but when he became unavailable I looked for someone new. As I mentioned above I was in physical therapy before seeking a trainer. I called one of the physical therapists and she recommended you, Chris and by extension Body Basics. She told me they were referring clients. Because you were recommended so highly and then when I worked with you for a bit I thought it was a good fit. Primarily it is that you listen, you take what I say seriously and do not intimidate me or make me feel that I have to do anything I am uncomfortable doing or simply cannot do. My goals were pretty basic – to be able to function well in my day-to-day living, to get stronger/strengthen my leg and to begin to replace all of the muscle mass I had lost from disuse. I think I have been with Body Basics 3-4 years and I believe I have exceeded the goals I set for myself when I started. As I became stronger my goals evolved. I keep working to improve the functioning of my body to keep it at its best: my leg, my posture, my balance,my range of motion. To maintain my functioning and not lose any ground and slowly improve what I do have – within my body’s limitations. Bobbie Raine ~ for continuing to master her squat form, recently sharing how she can now get up from the toilet hands free! Susan King ~ for showing such dedication to her exercise program that she bought travel-friendly exercise tubing to take with her overseas to use while on vacation! Kelly Frost ~ for experiencing her best hiking tour in 6 years of doing so since starting her training sessions at BodyBasics! Chuck Warren ~ for his silent example of persistence as he dedicates time before and after each workout to do what can be hard to do, spend focused time improving areas less developed! Cameron Foss ~ for nearly touching the studio ceiling with a box jump of 54 inches! 1. Dice onion. Place in skillet. 2. Mince garlic and ginger. Place in skillet. 3. Drizzle olive oil over onion, garlic and ginger. Place over medium heat. Stir around as it begins to sizzle. 4. Dice celery and carrots. Add to the skillet. Mix around. more olive oil if needed to prevent sticking. 7. While the filling for the lettuce wraps cooks, get the lettuce leaves ready. easily or you can steam them to prevent breaking. 8. Slice radishes, bell pepper and cucumbers to accompany lettuce wraps. sesame oil, rice vinegar and salt. 9. 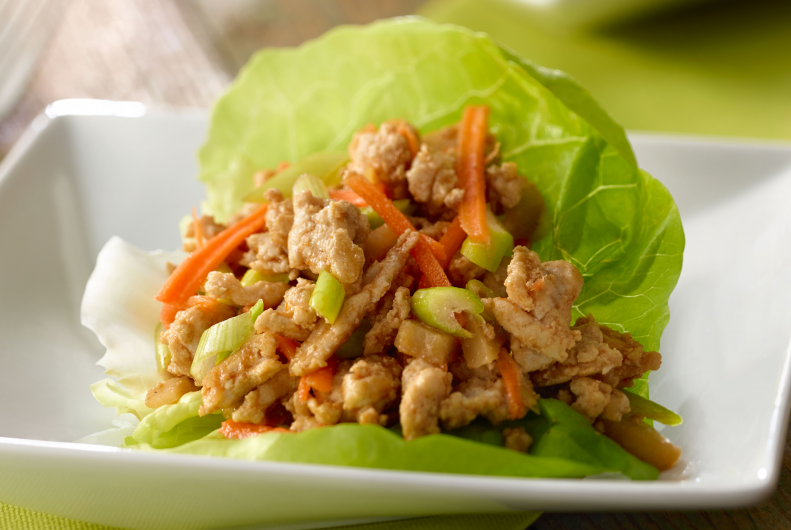 Serve lettuce wraps with veggies and hot sauce (if desired).